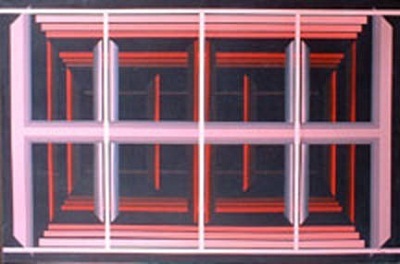 The Dean of the College of the Arts, Raymond Mannoni, bought this painting for the permanent collection of the Museum of Art in the beginning of the 1980s. It was strikingly modern. Executed as cold linear geometry, horizontal bands meeting vertical ones, the variations in warm red tone on the black background provoke an illusion of depth that can fool the eye. It is a combination of Constructivism and Op-Art, like Vasarely had made it spectacularly popular in France. But Lucy Webb is simpler, more serious, more authentic in her research.